Learning a new program can feel a bit overwhelming, right? Like... do you really need to master one more thing and wear one more hat as a creative business owner? Let me tell you from experience that Lightroom is worth learning and I'm here to get you started on the right foot from the get-go. If you're a seasoned pro and you've had Lightroom for quite a while, I'd love to hear if you learn anything new! And of course share your advice for Lightroom newbies in the comments below. 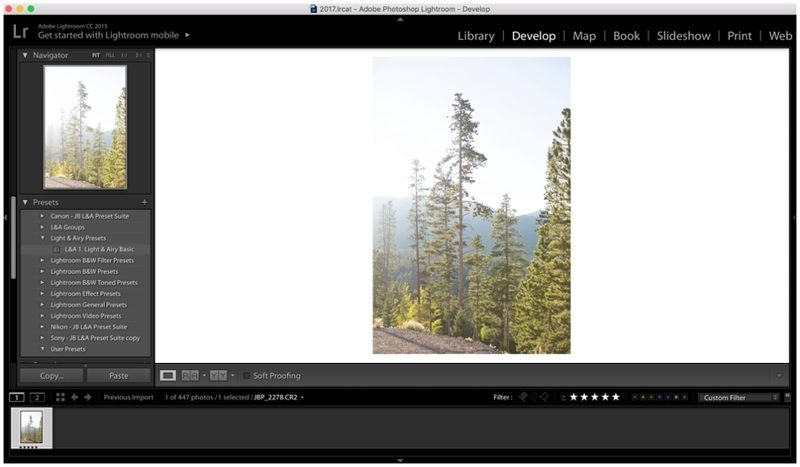 So are you ready to download Lightroom, get all set up and edit your first image? Here we go! You'll want to make sure that your images are in the RAW format so that you can maximize your editing in Lightroom. In your camera settings, you'll have the option to switch from JPEG to RAW and it will be the best switch you've ever made. Well, that and switching over to Lightroom. And a good, consistent editing and shooting strategy. Okay, so it will be one of the best switches you've ever made. Side note: totally took these photos while hanging with my Uncle and sis in Breckinridge. I'll just say that I wouldn't mind eating out, soaking my feet in the hot tub (I know, I know! But I'm pregnant so I have to stick to just my feet!) and wandering to the peaks of mountains every now and then. Basically, I'll be back, CO.
Ready to get your editing game on and #rockyouredits? Lightroom is the fastest and easiest way to nail consistent edits, so it's time to download their free trial. After your 7 day trial is up, you can snag a license for Lightroom or the entire Adobe Collection. While I don't recommend using Photoshop to handle your photo editing, it definitely comes in handy from time to time and Adobe InDesign is invaluable to us creatives as well. If you have a feeling you'd want to use those programs, opt for the "All Apps" license. If not, the "Single App" license is for you, you Lightroom guru. And I know, I know - you don't consider yourself a Lr guru right now, but this tutorial will walk you through what you need to know to get started! It's important to look at what kind of license you're buying from Adobe. The individual license can only be used for, well, individual and personal use. If you're a momma who's just editing photos of your sweet littles, snag the individual license. If you're a student or educator, don't miss the discounted Adobe license. Next, you'll see a new screen with access to your computer and all its folders on the left. Find your folder, click on it and then select "Import" at the bottom right part of your screen. Once you do this, Lightroom will start importing all of those gorgeous images and you'll be ready to start sorting through your photos! Curious about shooting in RAW? Here's a whole post I wrote walking you through the benefits: RAW vs JPEG. In the photo editing world, choosing your favorite photos is called culling. You could buy an additional program that claims super fast culling speeds or you could use a few simple Lightroom hacks and keep your culling super quick. To choose your favorites, make sure you're on the Library module and select the first photo in your beautiful gallery. You should definitely already be in the Library module if you just opened Lightroom, but this is key to ultra-fast editing, so you'll want to double-check. I bet you thought this key would only come in handy when typing happy sentences, huh? Happy sentences like "YOU GUYS. LIGHT AND AIRY PHOTOS ARE A DREAM AND I JUST LEARNED TO SHOOT IN MANUAL" because let's get real - that's a win right there. I stumbled upon this key by accident and when you have your caps lock on, Lightroom will auto-advance once a photo has a rating. Hello, ultra fast editing speeds. Hit the caps lock button and voila! Easiest way to sort through your RAW photos? Put one finger on the ONE (1) key and one finger on the ZERO (0) key. You'll hit the 1 key when you want to keep the photo and 0 if you don't want to keep it. Don't worry - you won't really be deleting any images, but you'll star your photos to sort through the ones you actually want to edit (goodbye, duplicates and "oops! I didn't quite nail it in-camera photos!"). Since you have your caps lock on, when you hit the 1 or the 0, Lightroom will take you to the next image. Once you're finished going through your gallery and leaving a 1 or 0 on each photo, turn on your rating system through "Filter." You can do this by going to the bottom right hand of Lightroom, locating the "Filter:" option and selecting "Rated." Next, select "rating is greater than or equal to" in the drop down menu. Click 1 star so that you can filter through your gallery of images and only look at your favorites. Bam. Now you're ready to get your editing game on! You're about to have a best friend named light and airy photos for days. There's one reason presets are amazing: you click a button and your photo is edited for you. You'll still need to know how to use the sliders and make your own adjustments in Lightroom, but that's why I'm here. I'll teach you how to do all of that. So go ahead and download the free light and airy preset below and I'll walk you through installing this beauty! Did you sign up for the free light & airy preset? Perfect. Open a new tab and click on the email I just sent you. It will have a link to your download. Once you've started your download and located the free preset (in a zipped folder) on your computer, come back over! Click play below to see exactly how simple it is to install your presets in Lightroom! Lightroom now knows exactly where to find your new preset and it just needs to be closed and reopened to do it. So go ahead and quit Lightroom and open it back up again! When you do, you'll see your free light and airy preset waiting for you in the Develop module. Now that you've installed the preset, next time you'll just be able to import your photos, cull them and get straight to editing. Also, see those mountains in the distance in the photo below? This Missouri girl is just a bit obsessed with those beautiful blues and the rise and fall of the horizon. And all the midwesterners said amen. Time for the fun stuff! Let's edit your photo. Go ahead and select the first photo in your gallery and make sure your filters are still turned on (you'll always want to check this when you're opening Lightroom) and set to show all of the 1 star photos. 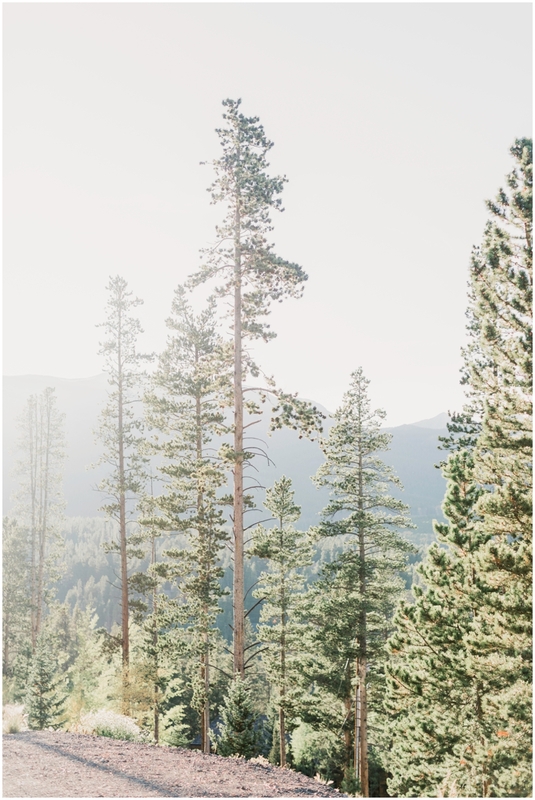 Once you've selected the image you want to edit, click on the "Light & Airy Basic" preset and watch the magic happen! From here you'll still want to make a few adjustments: you might want to increase the exposure or contrast or warm up the temperature just a bit. If you don't see the preset on the left side of the screen (like in the image below), make sure you're in the "Develop" module. More often than not, you'll need to adjust your exposure and contrast to get the light and airy look you're going for! You'll find these settings on the right part of the screen under the Develop menu setting. Here's another setting you'll want to look at. As you drag the temp slider to the left, you'll see your image warm up. The tint will need to be adjusted to as you adjust the temp to avoid an overly pink or overly green image. If you need to really fine tune this because your lighting was a little wonky while you were shooting, read about how to save tricky photos (scroll all the way down to the bottom of this post). So my guess is that you just edited that photo and it was way easier than you though it'd be. Am I right? Here's where Lightroom gets even better! You can now copy all that hard work from one photo to the rest of your gallery. I know - throw in a batch of cookies, pull out icy cold milk and celebrate by pretending calories aren't real one bit. Make sure you're on the image you just edited. Then hold the "shift" button on your keyboard and select any other photos that need those same adjustments. You can also just select Command + A on a mac or Control + A on a pc to sync the settings with every image you see. Once you have the images selected, click "Sync" which is located right under all of the adjustments we just talked about. When you click sync, you'll see this window. Click "Check all" and then uncheck Transform, Spot Removal, and Crop. Click "Synchronize" and you're good to go! Once you've synced your edits, you'll want to go through each photo and make tweaks here and there, but your gallery will be pretty close to what we like to call light and airy dreamland. It's true, it's true: 10 seconds. What would life be like, right? Let me tell you - it's like you load your images into Lightroom, do your quick cull, and you have a gallery edited, exported and uploaded for your client (or blog) in... pretty much no time. Ya know, so you can get back to doing life with your people. And adventures. Did I mention I'm an adventurer? Well, I guess you probably gathered from all the mountain photos. Ha! I shared a couple of live videos about my editing process and how I just had to mix and match a few presets to get looks-like-film images every time. I really just wanted to help other photographers and I started getting loads and loads of Instagram messages and emails asking if I'd make the presets available to everyone. So I did! You definitely don't have to buy them to have a gorgeous edit! That's what the free preset is for. We just know how challenging it can be to make digital look like film and do it quickly. So if that sounds like something you need (or if you just don't want to spend a ton of time figuring out the ins and outs of every slider in Lightroom), here's a link to the presets. Just for example, here are two different looks you can get simply by mixing and matching the presets. You can really go any direction you want! I love, love, love that these presets can grow with bloggers, photographers and creatives. I love that they don't lock you in with a style, but give you the freedom to find your own and the confidence to submit your work, blog your work and just shout it all from the rooftops (or mountaintops in this case). If you have Lr questions, preset questions or anything of the sort, leave a fancy schmancy comment below or join our facebook group and start the conversation! Name your board "Lightroom Tips" so we can find your faves!